Other systemic diseases and treatments: what is an immunocompromised host? 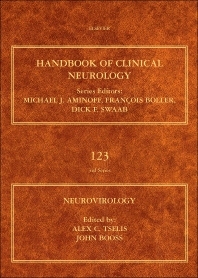 This volume in the Handbook of Clinical Neurology series provides a complete review of the history, science and current state of neurovirology. It covers the science and clinical presentation, diagnosis, and treatment of viruses of the brain and central nervous system, and is a trusted resource for scholars, scientists, neuroscientists, neurologists, virologists, and pharmacologists working on neurovirology. Neurovirology has been significantly bolstered by modern technologies such as PCR and MRI with direct impact on isolating viruses and advancing therapeutics based on molecular medicine. These advances are particularly important today with the introduction of emerging and re-emerging diseases such as HIV/AIDS, Nipah encephalitis and the appearance of West Nile encephalitis in the western hemisphere. I graduated with a B Sc in physics from McGill University in Montreal in 1978. I obtained my PhD in physics from Brown University in 1983. After postdoctoral work at Purdue University, I entered medical school at the University of Miami in Florida, graduating with my MD in 1987. I trained in clinical neurology at Northwestern University and Duke University, followed by postdoctoral training in neurovirology at the University of Pennsylvania, 1991-1994. Since 1994 I have been on the faculty at the Department of Neurology at Wayne State University. My laboratory work had been in the virology of the nervous system and in viral immunology with emphasis on the cytomegaloviruses. Clinically my interests had been in viral encephalitis, multiple sclerosis, and HIV of the nervous system. From 1993 until my retirement in 2005, I was the National Program Director for Neurology for the Department of Veterans Affairs. Our goal was to have neurological services coordinated nationally. During that time we were able to establish national centers of excellence for Parkinson’s Disease and Multiple Sclerosis. Just after my retirement, a coalition of organizations led by the American Academy of Neurology convinced the Congress to establish national VA centers of excellence in epilepsy. I am presently interested in historical subjects including historical virology: see for example To Catch a Virus, Booss and August, ASM Press, 2013; and Neurovirology in the Elsevier series Handbook of Clinical Neurology, eds, Tselis and Booss, forthcoming, 2014.